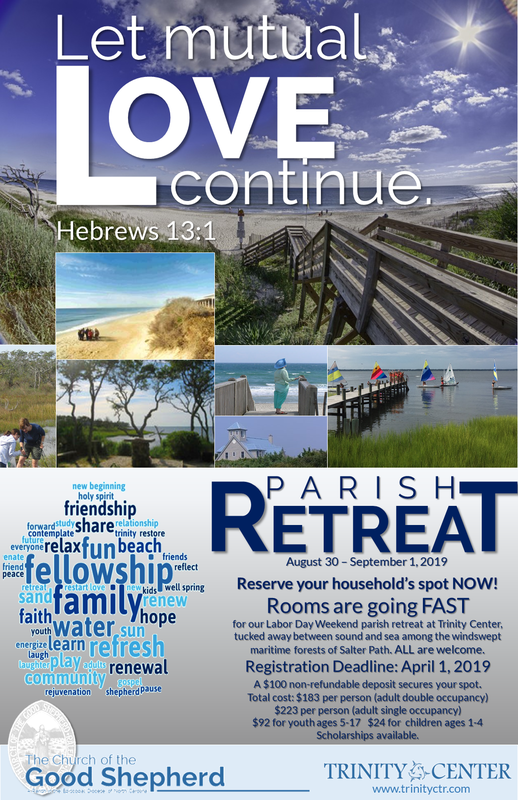 Get registered early for our Parish Retreat! Scroll down to the registration portal. This looks awesome! Please put me/us on the wait list! Once registered, please remit payment to the parish office. (attn: Bev McTaggart). Rate includes Friday night and Saturday night stay (rooms have 1 Double Bed and 1 Twin bed along with ability to have roll away twin bed or air mattress or sleeping bag for maximum of 4 occupancy per room). 2-room pods are available connected by adjoining foyer. Meals include Saturday morning breakfast, lunch and dinner and Sunday breakfast with box lunch on Sunday at lunch. Pot luck appetizers for Friday night social. A $10 Program Fee will be added to each registration. Scholarship funds are available. Please contact with the Rev. Dr. Cheryl McFadden with questions. Would you like to pay it forward and contribute to the scholarship fund? Contact Rev. Cheryl to find out how!